Brushing and flossing help to prevent gum disease by eliminating harmful bacteria and strengthening the soft tissues. Brushing and flossing help to prevent premature tooth loss by reducing the inflammation that causes bone loss and controlling the bacterial acids that cause dangerous infections. Brushing and flossing are excellent for controlling bad breath. The clinical condition know as halitosis is caused by food particles and plaque that can easily become trapped between the teeth and in the surface of the tongue. If this tip doesn’t help to eliminate your bad breath, you could be dealing with a more serious underlying health problem. Brushing and flossing can prevent stains from invading your smile. Plaque and tartar are magnets for stains, especially the stains that tend to develop between the teeth. Proper, daily cleaning is the best way to keep the discoloration to a minimum. Brushing and flossing help to prevent tooth decay. The teeth are under constant attack by food particles and plaque acids. 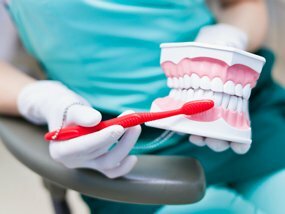 Eliminating or disrupting the film of plaque on the teeth and neutralizing acids in the mouth can mainly be achieved through proper brushing and flossing. Don’t neglect your oral health by failing to brush and floss on a regular basis. Diseased gum tissue and eroded tooth enamel are signs of irreversible damage, but you have the tools to avoid these common dental problems. Commit to a healthy dental regimen to protect or improve your oral health. You can learn more about the benefits of old-fashioned brushing and flossing by contacting a dentist in Anderson SC today. I appreciate how they let me know what is about to happen and how much time each process will take. That way I am more at ease knowing how things are going to move along. Love this dental office. Top notch!